Analog Devices AD558 is an 8-bit I²L DAC in ceramic package (MIL spec). It is still an open question how this chip got into ex-USSR/Russia - anonymous reader left no comments on that (this smells like cold war...). It is not a secret that Russia had no extensive civilian IC assortment in manufacturing, hence all military IC's must have been designed and manufactured from scratch (i.e. all R&D, prototypes and masks must be paid by government). In such conditions providing all variety of domestic ICs is economically impossible, at least without government expenses comparable to whole world's expenses on IC R&D. So "temporary", "case-by-case" permit to use imported (both legitimately and not-so-legitimately) western ICs in military equipment "until domestic products are ready" is still here after 24 years despite numerous attempts to end this practice. 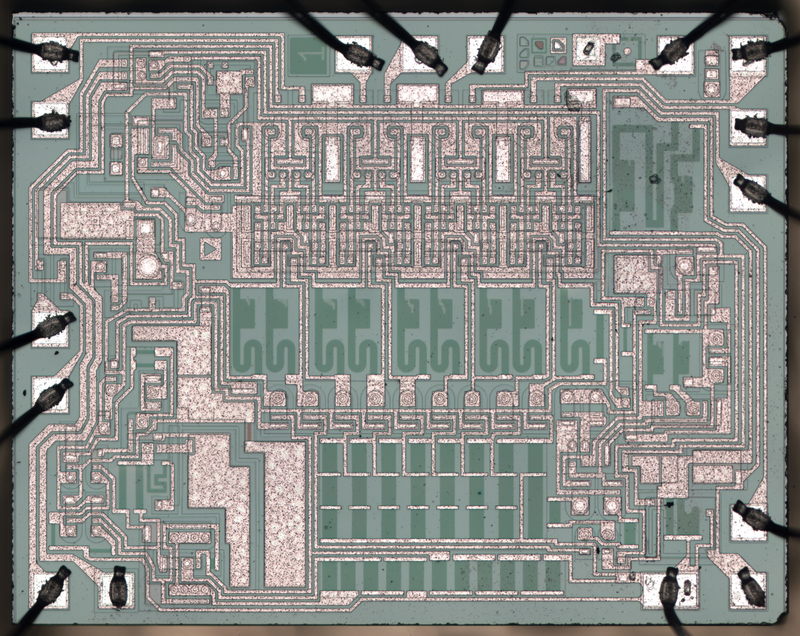 Die size 2713x2141 µm, 6µm manufacturing technology, trimming laser was leaving ~8µm diameter spots. Oh, these rounded resistors are just beautiful... Autorouters in 2014, do you see this? Note how amount of laser trimming on R-ladder is different for different bits. PS. Could anyone share position of western engineers on plastic-vs-ceramic package for military/space-grade IC's? It appears modern plastic packages offer more benefits (like better G-shock/vibration reliability and obviously cost) without sacrificing anything (temperature range and moisture are less of a concern now, radiation was never a concern for a package).